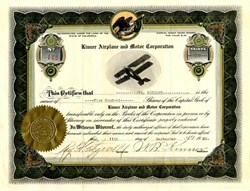 Beautiful RARE uncancelled stock certificate from the Kinner Airplane and Motor Company issued in 1920. This historic document has an ornate border around it with a vignette of an biplane (Airster?). This item has been hand signed by the Company’s President, W.B. Kinner, and Secretary, Ray H. Fitzgerald, and is over 91 years old. The certificate was issued to WM. Eckhart. This is the first time we have seen this early handsigned certificate from Kinner Airplane and Motor Corporation. Winfield Bertrum "Bert" Kinner (December 16, 1882 – July 4, 1957) was an American aircraft engine designer and constructor. Kinner founded Kinner Airplane & Motor Corporation in Glendale, California which produced radial engines and aircraft. Bert Kinner was born on December 16, 1882 in Iowa. His father was from New York, his mother was born in England and her maiden name was Lee. Kinner married Cora M. (1887–1982) and they had two children: Winfield Bertrum Kinner II (1911–1993); and Donald W. Kinner (1914–?). Cora was born in Minnesota and the children were born there. In 1920, Kinner was working as an aircraft engineer in Los Angeles but had an aspiration to design and build aircraft. He was the manager of Kinner Field, the first municipally owned airport in Los Angeles, located on the west side of Long Beach Boulevard and Tweedy Road, below Huntington Park. 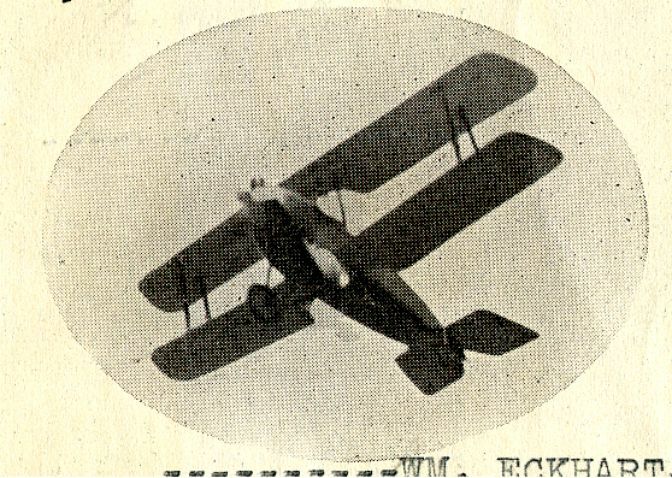 His airfield included a small hangar, 1,200 ft, roughed out runway and one employee, Anita "Neta" Snook who had recently arrived from Iowa after a season of barnstorming with her Curtiss JN-4 Canuck in tow. "Snooky" turned out to be a good hire as she not only chatted up customers, ran the air operation but also served as a mechanic. Kinner hired Snook to test fly his planes and provide flight instruction for a prospective training school. At the "Kinner Airplane & Motor Corporation," he began to design his first small, light-plane called the Security S-1 Airster (more commonly known as the Kinner Airster). The tiny biplane was powered by a three-cylinder Lawrence L2 that put out 60 hp. Kinner Field's most famous student, Amelia Earhart arrived in December 1920. After taking her first flying lesson with Neta, Earhart bought the prototype Kinner Airster for $2,000 to continue her training. The bright yellow biplane that she immediately christened "The Canary" was underpowered but provided Earhart with valuable flight time. When she wasn't able to raise more than the deposit, Kinner made a deal with her so that the Airster could be on hand as a demonstration aircraft in exchange for upkeep and hangar fees. Earhart soloed in the Kinner and after Neta left Kinner field to get married, Earhart stayed on and continued flying. In October 1922, the Kinner Airster was used to set a world high altitude record of 14,000 ft for women pilots, the first of the many records set by Earhart. In the 1930s, Kinner was the owner of Security National Aircraft Corporation at Downey Field, now Downey Studios. He died in 1957 in California and was buried in the Portal of Folded Wings Shrine to Aviation with other aviation pioneers.